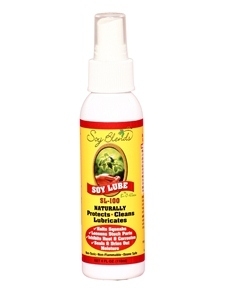 Soy Lube SL-100 (4 oz) - (Case of 12)  : Welcome to Sheepish Distribution!, All Natural Care Products! Finally…An effective non-aerosol lubricant that’s safe for you and the earth. Most petroleum-based lubricants are harmful or fatal if swallowed. Biokleen Soy Lube SL-100’s biobased formula is made entirely from renewable resources for an effective lubricant that lasts longer and is less hazardous than mainstream alternatives.